Your children or grandchildren will love these comfortable, long sleeved mock tees that are embellished with vibrantly colored, desert creatures. 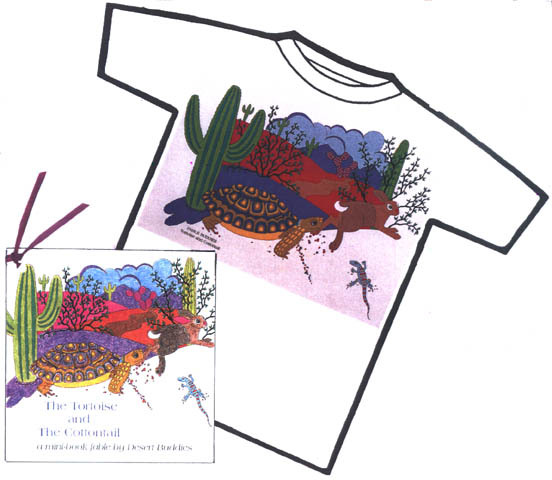 Each Desert Buddies t-shirt comes with a mini-storybook. Together they tell a tall tale of real desert critters in fantastic situations. Choose from "The Tortoise and The Cottontail" which appears above or "The Coyote and the Roadrunner" which appears below. The t-shirts are colorfully printed front and back. Available only in long sleeves. To read a biography on the artist click on Nancy Lenches.